These Special Purpose Bits will allow you to be more creative and productive. 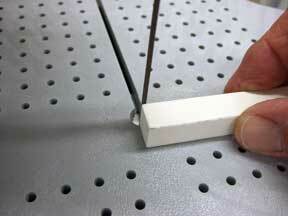 Jewelry bits are used to grind a groove into the edge of a fused glass cabochon. The groove will fit 16 or 18 gauge wire. Wrap the wire through the groove to create stunning jewelry. Finest quality, 220 grit. Made with Glastar's Diamond Bonding Process for maximum life. Create a custom frosted bevel within minutes using either of Mika's beveling bits. Inside curves, outside curves and straight lines - all are no problem. The design of these bits will have you beveling your glass or creating decorative edging like an expert within minutes. Fine grit diamonds give a softly frosted finish. Photos below show diamond surface facing up for illustration. Photo at lower right shows beveling bit as it would be mounted on your grinder. Lamp Bits leave a lightly mitered edge on your glass pieces allowing a tighter fit, finer solder lines and a more professional overall appearance. Ever come upon some heavily textured glass (like ripple) that is just to tough to fit into your lead came? Ripple bits are your answer. Special diamond coated flanges chamfer the edges to ease insertion of thick glass into lead or zinc came. Two grooves to do more ripples. Sold in a pack of two.